Keep Britain Tidy is seeking new #LitterHeroes Ambassadors to join our volunteer programme and need your help! We are looking for members of the public who want to volunteer, and who have a real passion for community engagement and keeping public spaces clean. We’d love you to encourage them to apply to join our enthusiastic #LitterHeroes Ambassadors in becoming community activators across the UK. Apply directly online via https://www.surveymonkey.co.uk/r/LHAapply2019 or email LHAmbassador@keepbritaintidy.org and we will send a link to the application form, alternatively visit the website here for more information. 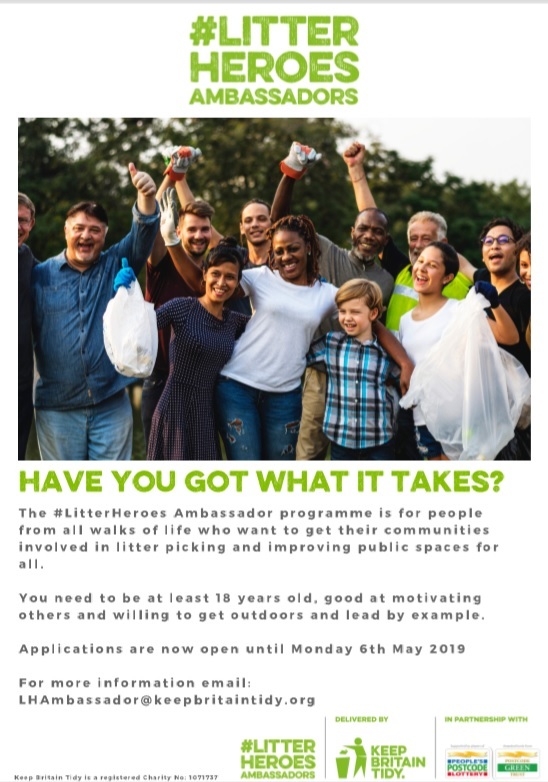 LitterHeroes Ambassador poster_2019Applications close on Monday 6th May 2019 and successful applicants will be notified of next steps during the week commencing 6th May.